This is a great project to make for young boys (and girls) who love Minecraft and don’t like to wear scarves! The Creeper Cowl is an easy beginner stranded colour work project that is knit in the round using bulky or chunky yarn. The colour work sections add some extra warmth for a cold winter’s day. 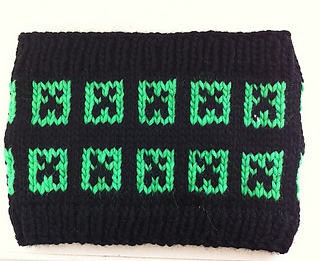 Thanks very much to Jan Baxter for allowing me to use her Minecraft Creeper Hat Chart in this pattern!